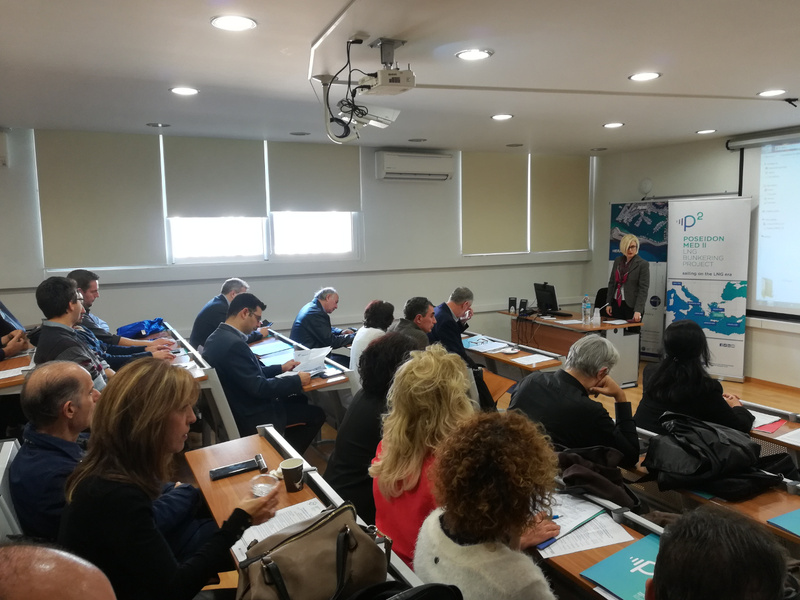 The European co-funded Poseidon Med II programme (PMII), organised a workshop at the Technological Educational Institute of Crete (TEI) in the context of its dissemination activities. The subject of the workshop, which took place on December 17th, 2018 was to present the appropriate framework for the adoption of Liquefied Natural Gas (LNG) as a marine fuel in the Eastern Mediterranean. The event was opened by the Rector, Mr N. Katsarakis, followed by a welcome note by the President and Managing Director of the port of Heraklion, Mr. A. Philippis. The event was attended by Professors and students of the Technological Educational Institute of Crete, as well as representatives from the Port Authorities and other stakeholders from the port of Heraklion. The links comprising the LNG supply chain that is the subject of the studies of PMII (M. Fotiadou / DEPA), the measurements of air pollutants at the port of Heraklion (A. Mitsotakis, CERTH) and the contribution of the large scale LNG infrastructure at Revythousa towards the successful development of small-scale LNG infrastructure in the ports of the programme (T. Eleftheriadou, DESFA), were some of the issues presented by the PMII partners. The studies of the programme on the selection of the optimum position for small-scale LNG facilities within the Heraklion port (A. Boutatis, ROGAN), shipbuilding and ship conversion studies for the use of LNG (G. Prakakakis, NAP) and the regulatory framework for LNG bunkering operations (A. Kouvertari, Lloyd's Register) were also discussed. Photo from the seminar room of TEI Heraklion, Crete, where the event took place. Photo of the Partners of PMII following the presentations.